Nothing goes better than finger foods and a great game. Wouldn’t you agree? They are so easy to pick up without even taking your eyes off the screen. Okay – well, almost! Just remember to bring the plate up with you to catch anything that might fall. But, of course, you already know that. Anyone hosting or attending a big game party this year? If you said yes or any of those, or even just kicking back at home, you really should have these on the menu! Not only are they incredibly easy, but they are so addicting and delicious. 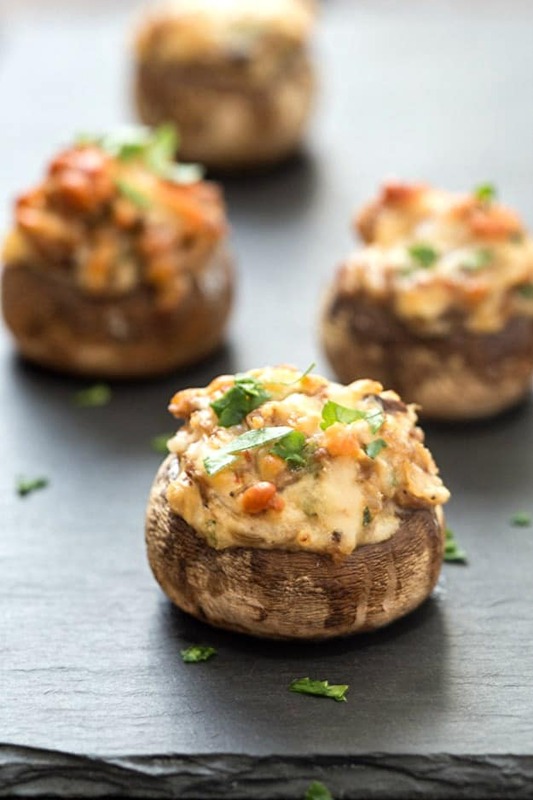 Each mushroom will have a little crunch, if you added a little extra shredded parmesan cheese to the top, with the most outrageous creamy filling inside. Go ahead and double or even triple the recipe. Trust me on this. They will be gone before you can even blink your eyes. For the filling, I wanted to use something that had a lot of flavorful already, like Johnsonville Hot Italian Sausage. For this, I used the sausage links and removed the casing. It’s like you do not even have to visit the spice isle, just skip it if you have salt and pepper on hand! If you can find the hot Italian ground sausage, then that’s perfect, and you just saved yourself a couple of minutes. 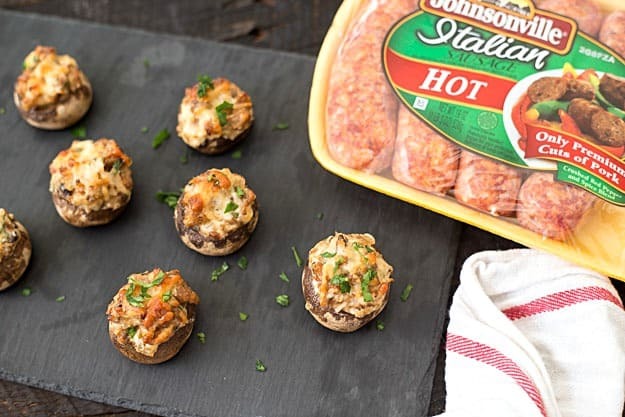 These Italian stuffed mushrooms with sausage are the perfect game day solution for the amazing “sausage bowl”! Isn’t that cute – sausage bowl? I kind of like it. Place the sausage in a medium skillet and brown until crumbly and done. Place the crumbled sausage on a paper towel lined plate. Set aside. Place the onions, mushrooms stems, and garlic in the same skillet and saute for 5 minutes or until the onions are translucent and the mushroom stems are tender. Season with salt and pepper. Cream together the parmesan cheese and cream cheese together in a medium bowl. Add the cooled crumbled sausage, the cooled onion and mushroom stem mixture, and fresh parsley and mix until combined. Place the button caps into a large baking sheet. 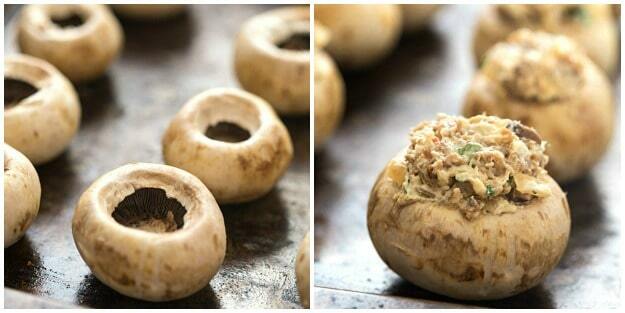 Fill each mushroom cap with the mixture using two spoons. 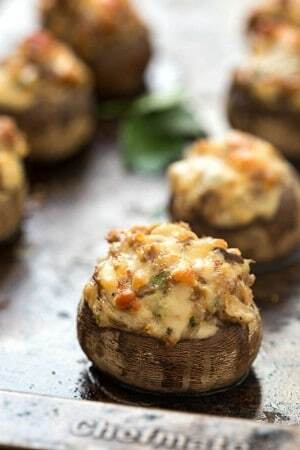 Top each filled mushroom cap with extra parmesan cheese. Bake for 20-25 minutes or until the tops are lightly browned. *You may use any kind of sausage. You can also use sausage links, but remember to remove the casing. i love that they are filled with hot Italian Sausage. Love the spice! Made these for a Christmas gathering. What a hit. Will definitely make again. 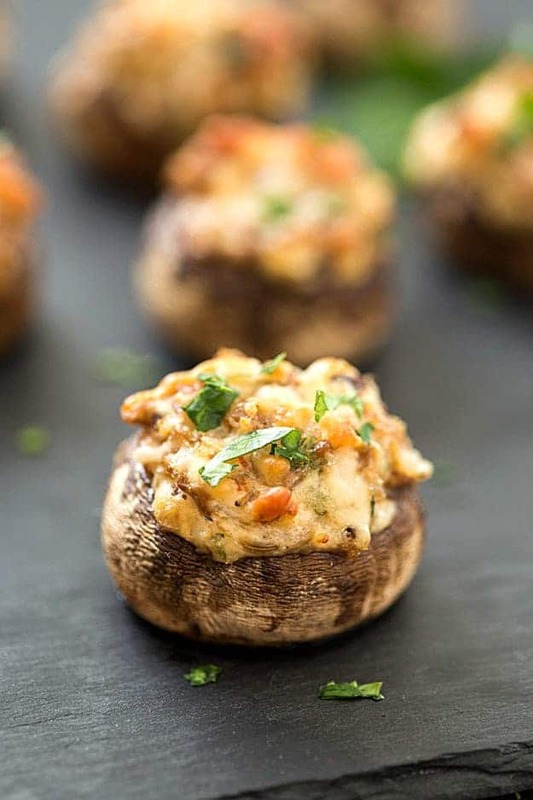 I made these for a Italian dinner night with friends and everyone LOVED them. I will definitely make them again.